Ryan Coogler is a producer of this follow-up to a surprising 2015 reboot starring Michael B. Jordan (whom Coogler directed in Black Panther) and Sylvester Stallone which won the latter an Oscar nomination in the millennial continuation of the Rocky Balboa saga. 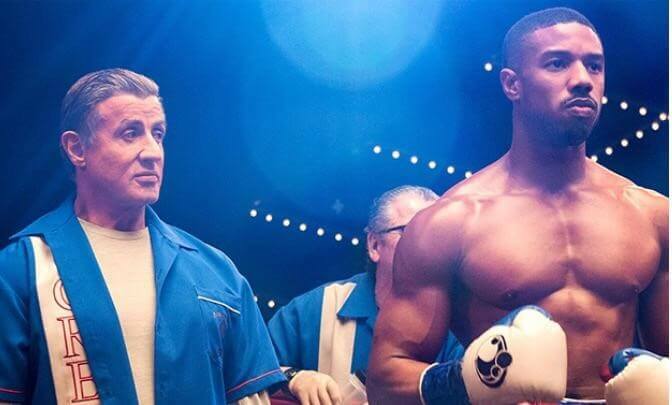 Creed II again features Jordan’s Adonis with unsubtle thematic resonance when it comes to the familial, solitude, culpability, and absolution in Steven J. Caple, Jr. taking over the director’s chair from Coogler as co-writer Stallone draws from the affected, jingoistic Cold War entry Rocky IV. Back in the Reagan/Gorbachev era when the Italian Stallion had to face Dolph Lundgren’s crushing, machine-like Ivan Drago in the square circle in Moscow after Adonis’ dad, Apollo (Carl Weathers), was pulverized to death by the imposing blond pugilist in Vegas. Now, Adonis has to come to terms with his feelings from the past and present (he’s about to become a dad) when the opportunity arises to meet Drago’s similarly strapping, sinewy son Viktor (Romanian MMA star Florian ‘Big Nasty’ Munteanu, who dropped 25 lbs. for the part). Tessa Thompson (Sorry To Bother You, Thor: Ragnarok, Selma) has that tender, polished heartfelt presence as the BAE who meshes well with a ruminative, intense Adonis (like the late Adrian was for Rocky). Caple, Jr. does enough with the set-up and reliable, if sentimental conceit to provide the necessary thrust which allows Stallone to again sensitively and humbly endow more than a trainer (a different toughness than Burgess Meredith’s Mick) or confidante for the son whose father he came to love. On the surface getting even is another chance to see how Stallone made it big during the bicentennial as Jordan ascends in his ‘excelsior’ (a signature sign-off from the late, great Stan Lee); also Phylicia Rashad as the wise adoptive mother displays her mettle as an actress. Finding the right new age narrative combinations for a franchise that won’t go down for the count is what a mentor and sagely figure like Stallone can possibly muster up again in true underdog, and more stirring fashion than this agreeable, but imitative round. MPAA Rating: PG-13 for sports action violence, language, and a scene of sensuality.